You are at:Home»Columns»Uncle DI»When will the Gawai end? When will the Gawai end? THE great festival, Gawai Dayak 2012, isn’t finished yet. The ceremony of Ngiling Tikai or Bidai later adopted by the community and supposed to mark the end of that festival is nowhere in sight. The spirit or mood of the Gawai goes on for another couple of weeks at least. Let the spirit continue, but it’s high time for those celebrating to do something else. Don’t you think so? In the Iban language, tikai is a mat and to roll it up is to ngiling it. If the festivities connected with the Gawai can last for a month or more, it must be a very long mat indeed. In terms of duration for a festival, the nearest equivalent of the Dayak celebration is the Chinese New Year, the end of which is marked by the Chap Goh Meh on the 15th day. The Gawai, however, has lasted until the end of June, possibly extended to July. It seems that what the Chinese can do, the Dayaks can do better in terms of festivals that is. Not being a gawai such as the Gawai Antu or Gawai Kenyalang, the Gawai Dayak was not specifically intended to have another ceremony like Ngiling Tikai or Bidai; that idea was added later. When an ‘official’ Gawai was first discussed, it was to be a one-day affair, two days at most. Gawai Dayak, now in its 49th year of existence, was an addition to the dozens of religious festivals already celebrated by the Dayaks in Sarawak since time immemorial. In the late 1950s, Dayaks who lived or worked in Kuching were influenced by their surroundings. If the Malays could celebrate their Hari Raya Aidilfitri and the Chinese their lunar year on a public holiday, the Dayaks would want to organise a big celebration of their own, on a day declared free from office work as well. In the past, they used to visit their Malay and Chinese friends during their festivals, now it would be good to reciprocate – for them to visit our homes? Sarawakians love to celebrate together! Initially, the Gawai was called the Dayak National Day. But this name was objected to by some government officials who feared that Dayak ‘nationalism’ (they meant ‘chauvinism’) would factor in the celebration. In the Council Negri, Tra Zehnder strongly fought for “a day we can call our own” but the Day was not approved until Stephen Kalong of SNAP became the Chief Minister of Sarawak. It was to be called Gawai Dayak Day instead, as a compromise. It was not to be a religious festival but gazetted as a public holiday on June 1 of each year. The first Gawai was hosted by Michael Buma at his house at Siol Kandis on June 1, 1963, before it was officially gazetted. This was supposed to be a combined gawai, the mother of all gawais, for all Dayaks drawn from the Bidayuhs of all the districts in the then First Division, for the Ibans from all over Sarawak and from the other non-Muslim ethnic groups classified as Orang Ulu in the northern region of Sarawak. It was a rather ambitious plan supported by the Dayak leaders who were members of the Council Negri and others from outside Kuching. Foremost among them were Temenggong Jugah of Kapit, Oyong Lawai Jau of Baram, Bangau Renang of Sibu, Francis Bujang and Francis Umpau of Kanowit, Pengarah Banyang of Julau. They approved of the idea of a joint Gawai as a platform for the Dayaks from the various ‘rivers’ to discuss common problems and pursue mutual interests. It was hoped that out of the festivities connected with the Gawai, there would eventually emerge a sense of belonging and identity among them as they prepared to handle the challenges of modernity and of the future in general. Those Dayaks who conceived the idea and those who supported the campaign for government recognition of the Day were mostly government servants who lived or worked in Kuching and their wives. Individuals such as Robert Jitam, Alfred Mason, Edward Jerah, Eliab Bayang of Julau, Philip Jitam were politically active during the Rajah’s time as well as during the Japanese Occupation; they injected the nationalist element into the proposal, which Tra Zehnder as legislator wanted approved by the Council Negri. However, most of the promoters were apolitical. Among them were the following whom we should all remember as well: Andria Ijau and his wife Vida Bayang, Pancras Eddy, Edward Enggu, Benedict Sandin, Susie Kitto and her mum Tuyah, Gladys Janting, Indit, Eliab Bayang, Mr and Mrs Senada, John Nichol. Indit, Samuel Gawing, John Nichol Kassim and his wife Vera, Charles Linang, Julia Linang, Mr Jaga, Mrs Ang, Barbara Bay, May and Mary Emai, Annie Jemat, Edward Jerah, Edward Brandah and his brother Andrew Jika Landau, Michael Buma, Brayant, Gerunsin Lembat, Albert Dass, George Jimbai, Ah Guan, Robert Sulis, Pengarah Rahun of Serian, Temenggong Salau Pa Nyaon and Remigius Durin of Bau. I may possibly have missed other names inadvertently. If so, I am sorry. My role was that of a tiny cog in the wheel. My job was to take down notes of meetings. Tra was, of course, the legislator who fought tooth and nail for its recognition. Although she did not get it there and then, yet it was gazetted as a public holiday when Stephen Kalong became the Chief Minister in 1963. 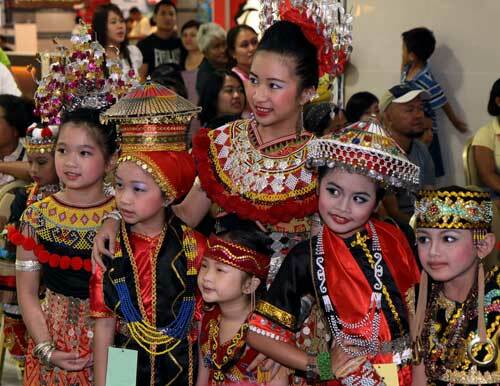 In the years that followed, the Gawai was celebrated with funds from the community themselves every year in Kuching at various venues – Jubilee Hall, Sarawak Union Club and the Rumah Dayak. It became so popular that eventually politicians seized it as an excellent platform for the promotion of cultural advancement of the various Dayak groups, and vote-fishing. It slowly became identified as Gawai Prentah, celebrated state-wide on a bigger and bigger scale each year. Street processions and dinners were held and people, mainly members and supporters of the ruling parties, took an active part. The Kumang and Keling contests remained the main feature of the celebrations. Politicians find it a suitable occasion to visit their constituents without having to answer a lot of questions and entertain requests for projects. Gawai is just not the time to talk politics; it is the time to be merry. The YB often sponsors a couple of trophies for winners of the beauty contests. Applause! In the beginning, the objective of the Gawai might have been a novelty – the concept of Dayak Solidarity – but as the Gawai has progressed over the years into a multipurpose celebration, its original aim is somewhat obscured in the process. Perhaps, next year being its golden jubilee, we can expect to see a special version of the Gawai with a renewed spirit shown by its early promoters almost 50 years ago. How’s that for an article about a festival beginning with the end of it, the Ngiling Tikai, and with a personal observation that it has become a series of festivities too long and too expensive. And too politicised.